The HPS15 distributed power front-end power supply can deliver 1500 W of output power at 85 percent efficiency at full load. 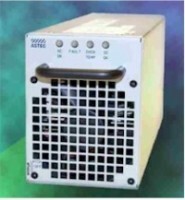 A 19-inch rack (HPR3) can be configured with up to four of the modules for a total of 6,000 Watts. In addition, the HPS15 series has an optional rack μController and optional I2C interface for the modules. Size (L x W x H):5.040" x 3.830" x 12.500"